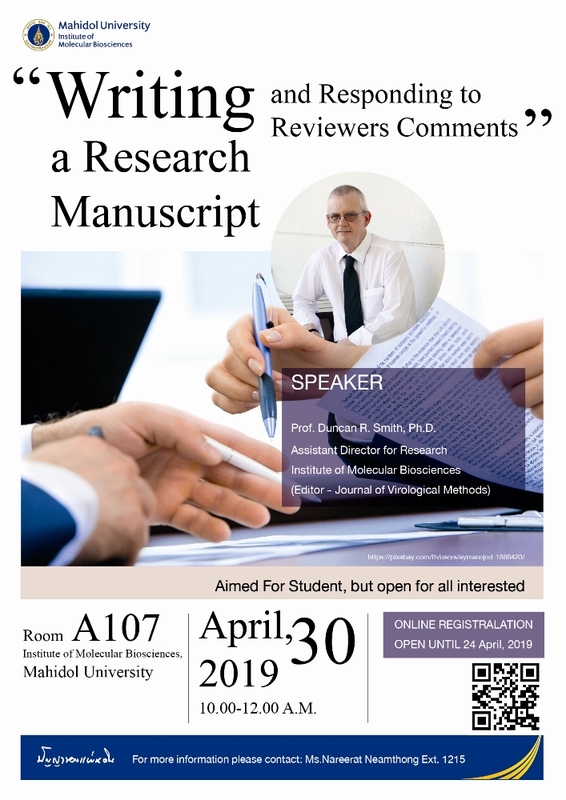 Invitation for MB seminar in topic ” Writing a Research Manuscript and Responding to Reviewers Comments”. Invitation for MB seminar in topic ” Writing a Research Manuscript and Responding to Reviewers Comments“. Speaker by Prof. Duncan R. Smith, Ph.D. Assistant Director for Research and editor Journal of Virological Methods. Date & Time : Tuesday 30th April 2019 , 10.00 – 12.00 A.M.
Revenue : Room A107 Institute of Molecular Biosciences Mahidol University. If interesting please register for online booking on link http://www.mb.mahidol.ac.th/limesurvey/index.php?sid=65295 or scan QR code on Poster before 24 April 2019. Free !! Registration Fee & Walk-in Available.